Direct waterfront log cabin with dock and raft. Direct waterfront log cabin with gorgeous western sunsets overlooking three mountain ranges, including Mt. Washington. Three bedrooms and one bath. Rustic knotty pine interior. Swim raft and 20' boat dock for fishing and boating. Two kayaks, one canoe, and a paddle boat. Hugh fire pit in back yard for roasting s'mores. Lazyman's hammock in between the spruce pines overlooks the lake and mountain ranges. Playroom in loft area comes complete with doll house and legos. Puzzles and every board-game imaginable. Huge reading library. TV, cable and Wifi. Complete kitchen with dishwasher and microwave. Cabin is located near all of North Conway's best vacation attractions including: StoryLand, Santa's Village, Six Gun City, Saco River, Kangamangus Highway, Skiing nearby at Mt Cranmore, Attitash, Wildcat, Black Mt and Shawnee Peak. Cross-country skiing, snowshoeing, ice-fishing, and snowmobiling right from our backdoor onto frozen lake directly behind. We used to vacation at this cabin and loved it so much, we bought it as soon as it was available for sale! The property is specifically geared toward families and we provide a lot of unique things for kids and families to enjoy. Our frequent guests often boast that they don't even have to ever leave our property....they can just vacation on our beachfront all day. We hope your family will enjoy it too. Our cabin is considered by many to be the Best Property on this Lake - best beach and best mountain views!!! 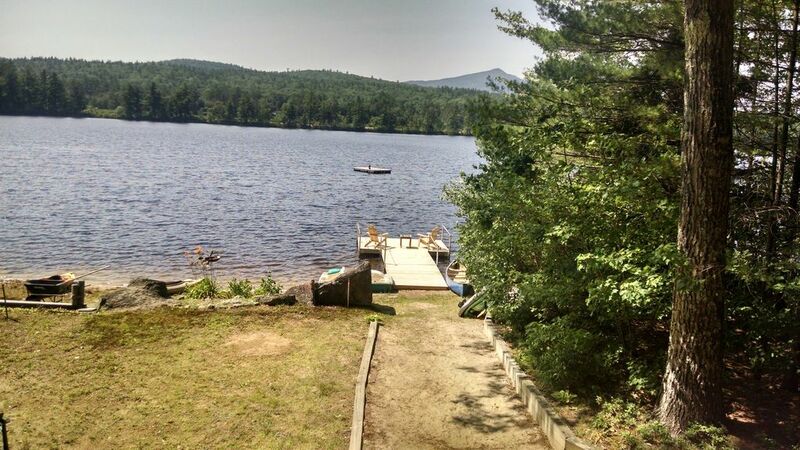 Our lake is North Conway's best-kept secret - close to all attractions, but away from the crowds. 60' of direct lakefront property with sandy beach that slowly slopes into water - ideal for young children. Property also features raft and dock. Gorgeous Western sunsets overlooking breath-taking views of three mountain ranges, including view of Mt. Washington! Cross-country ski or snowshoe directly from our door onto our frozen lake. Night-time snowmobilers make the tracks for you to enjoy during the day. Cross country ski in and out. Lights from waterfront propertiers illuminate the lake for night-time cross country skiing or snowshoeing. Very charming and comfortable. We stayed in the winter time and the place gets plenty warm between wood stove and heaters. Close to all that North Conway has to offer. 30 min to Cranmore, took about an hour to get to Bretton Woods and Ice Castles. Such a beautiful spot. Would love to stay again. all the necessities for cooking. Very nice owners who went above and beyond to make sure we had a nice stay. Highly recommend it. 3 adults, 2 terriers and 1 grandchild all enjoyed our weekend at moose cabin. Well-loved cabin and great location. Owners were very nice, too. Beautiful cabin! Lake appears small but there's a lot to explore and it's full of fish! Owners very responsive. Our family of four stayed here at the end of August and had a wonderful time! I can't tell you how great a location this is! This is definitely one the best homes on the lake as far as views and beaches and the way the sun hits it in the afternoon. I wish i could show you the photos of the sunsets I took. Our two boys aged 8 and 10 were able to catch fish right off the dock with ease, and they loved the paddleboat! There is also a canoe and two kayaks to use. The little beach area was really nice and clean and the big fire pit was great for roasting marshmallows. Star gazing was amazing on clear nights. The lake is clean, warm, and quiet, no motor boats screaming around all day. There are some weeds and mud when you get past the dock, not a problem for me, but my wife did not like it. The cabin is cozy and clean and the beds were comfortable, though i wouldn't want more than 4 people here. The bathroom is small and there isn't much comfortable seating inside or out. The kitchen is adequate and had everything we needed. There were plenty of fans when it got hot. The owners were very responsive to questions and were happy to have us there. There is tons to do in the area and you will not be bored. Conway is very cute and has a lot of shopping, restaurants and grocery stores. We went tubing down the saco, rode the alpine slides at attitash, drove up mt washington, drove the kancamagus and swam in the river, hiked the flume and Dinahs baths, and of course shopped the outlets. Our week flew by and wished we could have stayed longer. Thanks again Moose Cabin for a great week! Our stay here was nothing short of fantastic. There are plenty of fish in the water and charm in cabin. Everyone in family loved. Our cabin is considered "The Best on the Lake". Direct waterfront property with boats, raft, and dock. It's only minutes away from North Conway and outlet shopping. A short drive to all area attractions like: StoryLand, Santa's Village, Six Gun City, Saco River rafting, Kangamangus Highway, Cog Railway. 10 minute car ride to area skiing at: Mt. Cranmore, Attitash, Wildcat, Black Mt., Shawnee Peak, and Tuckerman Revine.